Rent a bike and put it on the back of the van (rack holds 5 bikes). After arriving at trailhead lock up bike then hike on your own schedule for as long and as far or as little as you like. After hike, unlock bike and ride it back downtown. (1/3 of the way is downhill, 2/3 flat.) There are two reasons why people do the Combo. 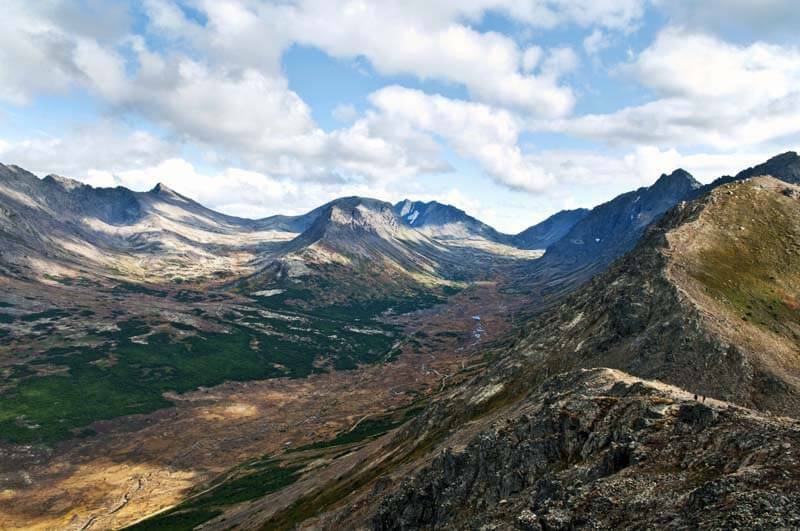 One, to be on your own schedule and spend more time hiking in the mountains. Two, for the thrill of riding a bike downhill. The Combo is not for everybody. The Combo is only for confident, competent, seasoned cyclists. If you are uncertain about your ability to safely ride a bike down a steep, narrow trail or road, take the van in both directions instead. You can still go for a bike ride before or after the hike on the Coastal Trail which is the superior biking experience anyway. The "SPLIT" saves you $2 on whichever activity you do second. If you have no doubt about your biking ability and you are 100% sure you will not be in over your head, there are four primary return routes to consider. Driver will map out your chosen return route at the trailhead. Also, if you sign up for the Combo, you must check-in at the bike rental between 11:30 and noon to be fitted with an appropriate bike. 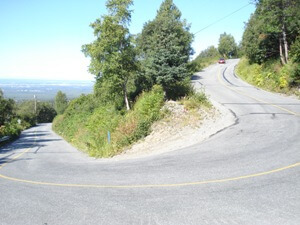 Image of Hairpin turn on Toilsome Drive. Driver maps return route at trailhead. Length: 16 miles. Duration: 1 - 2 hours. Click here for a video of the first 2/3 of the descent on the Powerline/Gasline Trail. 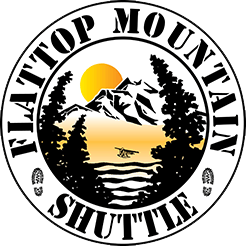 At the trailhead, driver will provide you with detailed maps and written directions. Click Here to see DBR's mountain bikes. Add $15 to rate for full suspension mountain bike. Beginning of Power Line Trail. This route is almost exactly the same as the route the van took to the trailhead so unless you want more time hiking in the mountains, it makes more sense to take the van both to and from the trailhead and rent a bike after you return downtown and take it on the Coastal Trail. Mellow section of Toilsome Drive. Length: 15 miles. Duration: 1 - 6 hours. 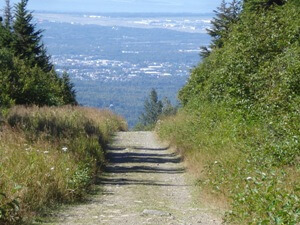 This route takes you past the Alaska Zoo ($15 admission) and also Alaska's H2Oasis indoor water park. ($25 adults/$30 Kids 12 and under.) After going under Seward Hwy take a right on the Old Seward Hwy. Left on E 100th. Right on King. Visit or ride past baseball batting cage. Continue on King. Visit or ride past Costco. Cross Dimond. Enter Campbell Creek Trail at Taku Lake Park. Ride midtown bike path next to C Street on a straight line to downtown. Alternatively, follow the Campbell Creek Trail west then use bike paths buffered from road to Kincaid Park where Coastal Trail ends. Bike Coastal Trail another eleven miles to downtown. Hairpin turn on Toilsome Drive. Most of the first four miles of this aptly-named road is this grade. Only riders in great shape should consider this route. 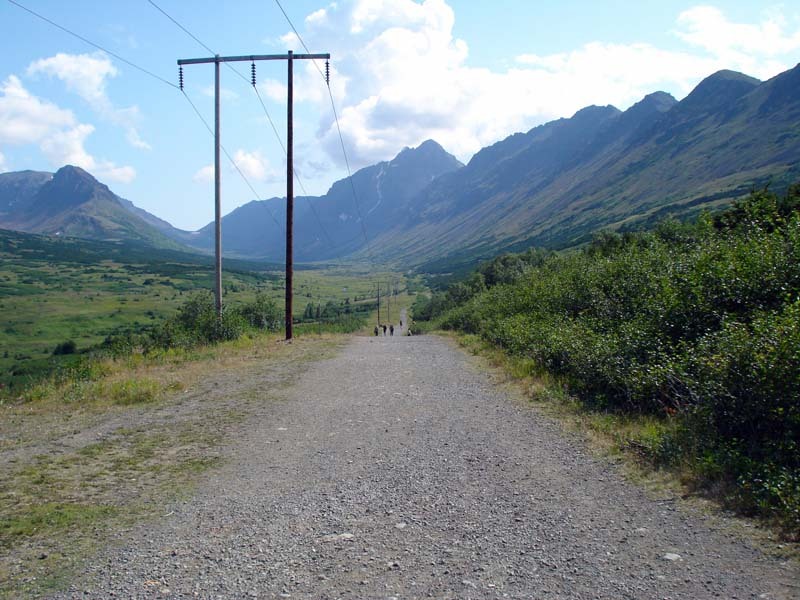 The Powerline trail gradually climbs east six miles. (Left) The pass is so steep it's necessary to carry your bike over it (about 1/4 mile). A very steep 3-mile descent into Indian Valley is on the other side. Click here for an edited video ride of the route. 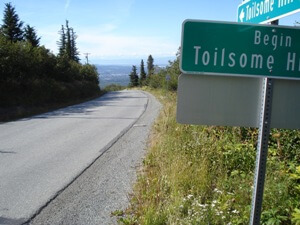 Then it is a 4-mile ride on a gravel road to the Seward Hwy, a 13 mile ride to south Anchorage, and another ten miles from there back downtown. Go to MTBR to read 16 reviews of this route. 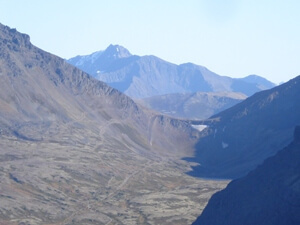 Image zoom-in of east Powerline Pass from north flank of Flattop. East Powerline Pass from north flank of Flattop. Return to DBR by 7:00 pm or pay $4, $3, $2, 1 extra hour(s) charge.